Just curious - how come the gun Carol took with her when leaving Alexandria was not in Olivia's notebook? Because if it would, even if it would be crossed out, it would most certainly make Negan's men suspicios but no such thing happened. Is it a safe bet to assume there might be other guns/ammo hidden in Alexandria not mentioned in Olivia's notebook? Good point. Although, didn't Rick say that there were some guns they took earlier from the Saviors they killed not entered in the log? That is how Michonne had a gun that was never logged. I think getting guns isn't as hard as finding food. Take out a few Saviors out on a scouting trip and you have a few guns. That's assuming should got the gun "legally" from the armory. It could be one she hid on her own. 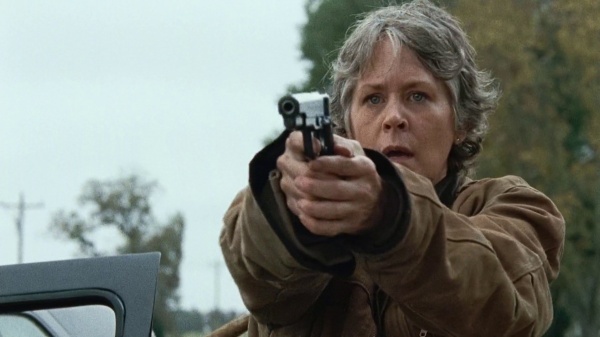 I thought the gun Carol had was from the Saviors. Isn't that what King Ezekiel said. I don't understand the big deal of Negan taking their guns. They're in Alexandria VA. The area around DC should be awash in available weapons. Ft Belvoir and Davison AAF are just down the street from them. The Pentagon isn't far, the Whitehouse, etc. I don't think he even intended on taking the guns until Carl decided to fire a warning shot. He wants them all in line and if they continue to resist there will be consequences. This one was taking all their guns. There might be plenty of guns around but not bullets. Without a way to manufacture bullets like what Eugene was talking about, everyone will eventually run out of bullets. Also, what does Rosita think she's going to do with one bullet? Also, what does Rosita think she's going to do with one bullet? My guess is (try to) kill Negan next time he comes around. Well I was assuming she was speaking figuratively because she was holding one shell casing. If she meant it literally that's pretty damn stupid, why would you set up a reloader, a scale and other tools, secure powder, make a primer, and forge a bullet to make one round? I feel like Carol could have had a gun stashed that nobody knew about. Didn't she get into the armory when she threatened that kid? I think those records are cooked anyway. There is a secret stash in an old house outside Alexandria nearby. It would be pretty stupid not to hide the rocket launcher in this case. I highly doubt Negan had known it was there, in their armory. So if they did make a secret stash, rocket launcher would certainly have been hidden. Edited by alexpetrov, 22 November 2016 - 01:35 AM. I'm thinking that this entire question is hinging on the assumption that the writers still maintain internal consistency.